Oh what a week!! Whilst at work on Thursday, the Pager Mega’s during a telephone conversation to Ian Barnard. . I see the immortal words *** MEGA-ALERT *** on the RBA pager. We both wait in silence for 15minutes before it says "MEGA HERMIT THRUSH CO. CORK". This happens to be one of the birds I’ve seen in many of my dreams. Am I dreaming? Quite possibly! Step One: Try to get the Car full. Step Two: Put out an advert for flexible Twitchers on the Pager. Step Three: Permission from the Boss for a days leave. Step Four: Run around my office like an adrenaline junky for 5 minutes. Step Five: Come back down to earth and speak to the internal Optomist Mr Evans. Conversation goes something like this. Lee says "You’ve got no chance in seeing it… it was only seen briefly by a few birders…it needs to develop a pattern before you can see it!" I just said "fine, I am still going for it, do you want to come? Lee says "Possibly I need to investigate further." After many more phonecalls etc I eventually left my house in Rusper , West Sussex at 18:50. I picked up Dave Webb (Adrian Webb’s dad) at 19:15 and then pick up Lee and Mick Frosdick at 20:15 at Junction 7 M4. Let the show begin. Interesting conversation started with Dave Webb discussing his Allens Gallinule find on Scillies last year. Then the incredible find by his 11year old son Adrian, finding a Long-billed Dowitcher at Dungeness. The resident warden didn’t believe it at first and refused to go to the hide where it was found. The Dowitcher then flew into full view of the Warden and he added "it could be a Short-billed Dowitcher". No hint of congratulations, but the Webbs were informed (by reserve staff) of a Cream-coloured Courser in Essex (on their doorstep) and both had good views of it a few days later. We arrived at Fishguard at around 1:00, check in time for the Rosslare ferry is 1:45, so we had plenty of time to kill. A foot pax day return to Ireland is now £19, so all being well it should be a cheap twitch. On the Stena Ferry there are lots of places to sleep. We opted for the Bar area. I had a traditional English breakfast for £9 in the restaurant. Then I went back to the Bar area where our corner stakeout had increased in size by fellow sleepers Richard Bonser & John Stephenson. Trying to sleep was close to impossible. Some extremely drunk 40year old Northern lass was singing badly and extremely loudly.. I shouted out "Shut it love, people are trying to sleep", but it did no good, she took no notice and carried out wailing some rubbish to impress a 60year old charmer in his shell suit sitting very close to her. This girl was quite attractive from a 200metre range, but closer inspection revealed she was just another BOBFOC. (Body off Baywatch, Face of Crimewatch). I suspected a sexual romp was on the cards, but fortunately for 57 people in the bar area they both fell asleep. Hooray peace at last. The boat arrived an hour later than schedule. (7:10am) This more or less put us all into panic mode, as it was going to be more or less impossible to get to Baltimore to catch the scheduled Cape Clear boat that departs at 11:00am. We picked up the hire car from Budgets around 7:25am. (Note Budget representative had not arrived to open the desk on our arrival, we had to wait a good 20 minutes for her to arrive). Stress levels of Mick & LGRE started to rise. All 3 parties departed Rosslare for the 4 hour drive to Baltimore, our car arrived first at around 11:40. Richard Bonser’s party arrived seconds later and Neil Allford arrived at 12:00. We then left Baltimore on a charter boat , arranged on route by Neil. The charter boat cost 25euros each. The boat arrived at the Cape at 12:50. 13 of us on the boat then made our way to the Post Office garden. Well apart from LGRE who arranged for the warden to chauffeur him and 3 Irish to the bird, also Mick & Dave got lucky and hitched a lift to the bird. The walk to the Post Office is about 20minutes from the quay. It is mainly uphill and very tiring. 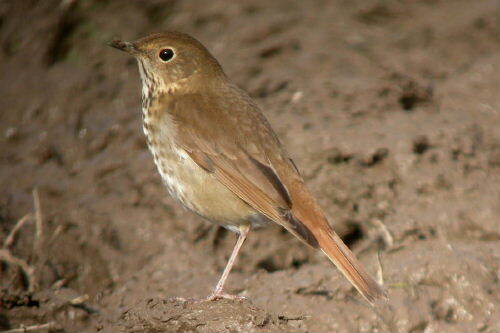 The Hermit Thrush was sitting on the fence on arrival. We had gorgeous scope views for 4mins and then the bird vanished. It was relocated by Neil Allford 30 mins later in a nearby field. We then watched in ore for the next 20mins. The whole twitch was so exciting, I really must go there for a Birdwatching holiday one day. The obs costs 18euros a night and only a handful of birders are currently staying on the island. I went to the Cape last year and dipped a Yellow-rumped Warbler, but even then I was impressed with the Island. We departed the Island at 14:20 and got back to Rosslare at 20:30, just in time for the 21:15 departure. Got home at 6:15am Saturday morning. My individual trip cost was £75+ food.